Graphene and CNTs are both made of carbon atoms. 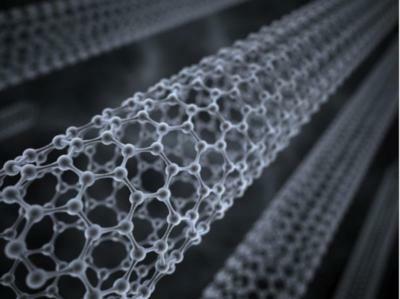 A carbon nanotube can be thought of as a sheet of graphene (a hexagonal lattice of carbon) rolled into a cylinder. Accordingly, CNTs can be used as a starting point for making graphene, by “unzipping” them. Both graphene and CNTs have exceptional mechanical and electronic properties, which can often be similar. Hence, they are often regarded as rivals for a host of similar applications. It should be noted that there is also an area of research focused on combining graphene and CNTs and using them together for various application like electronics, batteries, sensors and more. Despite these similarities between the materials, there are still differences between them. While graphene is considered 2D, CNTs are often regarded and 1D. Also, graphene (when ideally structured with atom purity and perfect honeycomb lattice) is a zero-band-gap semiconductor, whereas single-walled CNTs show either metallic or semiconducting properties, with a bandgap that varies from zero to about 2 eV. Working with CNTs is often considered challenging due to the intrinsic difficulty in positioning them accurately and connecting them. Graphene, which came into the scene later than veteran CNTs, can be easier to interconnect and dope, but carries its own set of challenges, like extraction, manipulation and stability burdens. Carbon is a non-metallic chemical element often regarded as a common element of all known life. It is the 15th most abundant element in the Earth's crust, and the fourth most abundant element in the universe by mass. Carbon can be found in many forms, each of which has its own physical characteristics. These forms include well-known materials like diamond and graphite, that only differ in physical properties due to variations in the arrangement of atoms in their structures. Other, less well-known forms are fullerenes - spherical, closed-cage fullerenes are called buckerminsterfullerenes, or “buckyballs,” and cylindrical fullerenes are called nanotubes. Another form, composed only of carbon atoms in a flat, 2D lattice structure is called graphene. Other forms of carbon atoms arrangements exist,like amorphous carbon, Q-carbon and more. A single, 2 dimensional layer of graphite is called graphene. So, graphene is basically a sheet of carbon atoms arranged in a hexagonal layout. Graphene is considered the first 2D material ever discovered, and is also called a ”wonder material” thanks to an enormous group of properties it holds. For example, graphene is one of the strongest materials in universe, has superior thermal and optical properties, excellent tensile strength, relative transparency, amazing electrical conductivity, and impermeability to most gases and liquids and more. Graphene’s many attributes make it an attractive material for researchers and developers, which are working hard all over the world to find endless uses for the material. Graphene’s tial is vast, and the applications include: touchscreens (for LCD or OLED displays), computer chips, batteries. energy generation, supercapacitors, medical equipment, water filters, solar cells and more. Carbon nanotubes (often abbreviated to CNTs) are cylindrically-shaped molecules made of carbon atoms. A sheet of graphene can be rolled-up to make a carbon nanotube. CNTs can be single-walled (SWCNT) if made from one layer of carbon atoms, or multi-walled (MWCNT) when consisting of several layers of graphene sheets. 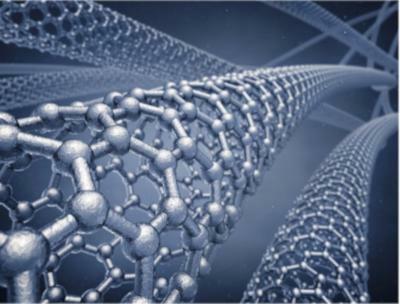 In fact, carbon nanotubes come in various diameters, lengths, and functional group content which can tailor their use for specific applications. The properties of CNTs change according to their characteristics. For instance, MWCNTs are usually conducting while SWCNTs can be electrically conducting, display the properties of a semiconductor or be non-conducting. Factors like structure, length, surface area, surface charge, size distribution, surface chemistry, and agglomeration state, as well as purity of the samples, have great impact on the properties of carbon nanotubes. CNTs have unique mechanical, thermal andelecronic properties that make them intriguing for the development of new materials: impressive mechanical tensile strength,light-weight, good thermal conductivity and much more. These properties make carbon nanotubes attractive for electronic devices, sensors and biosensors, transistors, batteries, hydrogen storage cells, electrical-shielding applications and more. Carbon Nanotubes have been around since the early 1990s and already found some commercial use in the fields of engineering plastics, polymers, displays, anti corrosion paints, thin films and coatings, transparent and non-transparent conductive electrodes, coatings and anti-static packaging and more. In addition, active research is ongoing in fields like batteries, fuel cells, solar cells, water desalination and more. However, after the initial hype, revolutions failed to happen and many gave up on CNTs. But this is not to say that they do not have actual potential and interest in them is reappearing in the research community in the last few years. As was said, they have found some uses and more are estimated to follow and the potential of CNTs is not considered to have been exhausted. CNTs are available in bulk quantities up to metric ton quantities. Production capacities for CNTs have been scaled up considerably over the years and currently exceed several thousand tons per year. It is estimated that several CNT manufacturers have over 100 ton per year production capacity for multi walled nanotubes. It seems that the capacity for the production of MWNTs exceeds that of SWNTs, although there is an oversupply in the market. SWNTs are much more expensive and difficult to manufacture than MWCNTs, and there is not yet a distinct large-scale market for SWNTs, which is needed to drive down the production cost. In terms of prices, SWCNTs are the most expensive type of CNTs, with a price tag of up to $100,000 per Kg - compared to around $100 per Kg for MWCNTs). Some manufacturers sell an intermediate type of CNTs, sometimes called few-wall CNTs. Prices for this type are varies, but can be about $1,000 per Kg. (estimated prices as per 2018). First Graphene is collaborating with Flinders University to launch 2D Fluidics - a company that will aim to commercialize the Vortex Fluidic Device (VFD). 2D Fluidics is 50% owned by FGR and 50% by Flinders University’s newly named Flinders Institute for NanoScale Science and Technology. The VFD was invented by the Flinders Institute for NanoScale Science and Technology’s Professor Colin Raston and enables new approaches to producing a wide range of materials such as graphene and sliced carbon nanotubes. The key intellectual property used by 2D Fluidics comprises two patents around the production of carbon nanomaterials, assigned by Flinders University. Researchers from the UCLA, Mississippi State University, University of Nevada and China's Central South have designed an efficient and long-lasting graphene-based electrode for supercapacitors. The device’s design was inspired by the structure and function of leaves on tree branches, and it is said to be more than 10 times more efficient than other designs. The electrode design reportedly provides the same amount of energy storage, and delivers as much power as similar electrodes, despite being much smaller and lighter. In experiments it produced 30% better capacitance — a device’s ability to store an electric charge — for its mass compared to the best available electrode made from similar carbon materials, and 30 times better capacitance per area. It also produced 10 times more power than other designs and retained 95% of its initial capacitance after more than 10,000 charging cycles.